After China's new regulations for religious affairs were enforced on Feb. 1, minors have been banned from entering places of worship in several regions, while Protestant house churches in Henan province have been forced to close. These are but a few example of a range of government actions in restricting religious activities on the mainland. Retired Cardinal Joseph Zen Ze-kiun of Hong Kong told ucanews.com that the government was tightening religious rules, with one source telling him there would be no Mass in a Shanghai underground church. "The priest has told Catholics not to come because there will be no Mass since they have not registered," Cardinal Zen said. A priest in Hebei province who asked to be anonymous told ucanews.com that authorities had asked clergymen in some parts of the province to post signs prohibiting minors from entering religious venues, prayer houses and other church premises. "They also threaten churches that they cannot be used if they refuse to post the signs," he said. A blogger wrote that "religious venues are the third premises following clubs and internet bars where minors are prohibited from entering by authorities." Peter, a Catholic in central China, said he had seen such signs posted in churches in Xinjiang. He told ucanews.com there are no legal grounds for officials prohibiting minors from entering religious venues. He accused officials of violating China's constitution, the communist-run country's supposed highest law. "When minors enter internet bars, the government and police turn a blind eye. 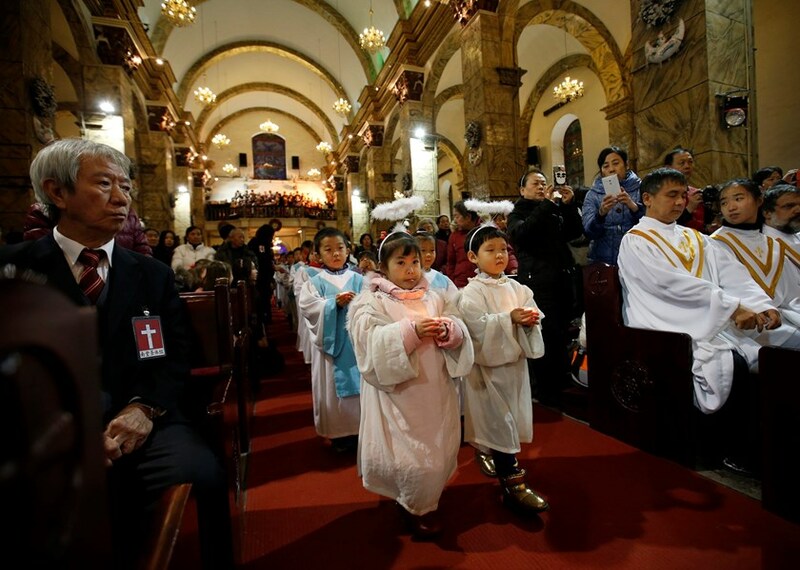 However, they are becoming very strict in prohibiting minors from entering religious venues. It is ridiculous," he said. Peter said the constitution clearly stipulates that citizens have religious freedom, while protection laws state that teenagers and children cannot be discriminated against because of their religious beliefs. He said the Universal Declaration of Human Rights also stipulates that parents have the right to educate their children in accordance with their religious beliefs. A message widely spread on the internet said that a Catholic woman in Xihua county of Henan province claimed that churches in the region were being persecuted. "Churches where we gather have been closed. Schools teach children to believe the [Communist] Party and not to have any religious faith," she said. "The local party secretary leads officials to villages, making sure no religious banners or crosses are displayed in violation of the law." Father Stephen of the underground church said children in school have to tell lies to cover their faith and not to express their true feelings. "Is this the way to build up our civilization?" he asked. Father Thomas of Henan told ucanews.com that authorities plan to call him to discuss how to exercise the new regulations. "All religious sites must be registered; no religious activities can be held beyond registered venues; non-registered clergymen are forbidden to host religious liturgies; and party members and minors are prohibited from entering a church," he said. "The living space for the church is getting less and less." The priest said he was talking to the State Administration of Religious Affairs "to strive for space for religious freedom and the church to survive; to protect the church and staff from being attacked; and to preserve the church's dogma." Father Thomas believes the regulations will be implemented differently across China, mainly depending on the relationship between the local church and the local government. Father John of the underground Catholic community in northeast China told ucanews.com that authorities had spoken to him about the revised regulations. "Officials do not want us to be really underground, which would mean they would lose our traces and not know where we are," he said. "If our dogma is not meddled with, everything will be fine. If the religious affairs bureau and the public security bureau understand us, they will not have any worries. If we are really undergoing clandestine activities, we are really a problem to them." He said the public security bureau wants to know their whereabouts and to put all their situations under its grasp. "For myself, I do not want to be hidden but if we are not allowed to have our religious gatherings, the only way is to become clandestine," Father John said. According to Xinhuanet's report on Feb. 4, document No.1 issued by the central government stressed that no illegal religious activities are allowed in villages. The document said authorities would act according to the law to step up efforts to crack down on illegal religious activities and foreign infiltration in rural areas, stop the use of religion to interfere with public affairs in villages, and continue to rectify the arbitrary construction of temples and religious statues in villages without approval. A priest who serves villages said authorities have placed greater restrictions on the church. "Some may say that if relations between the church and law enforcement officials are good, the church may get lenient treatment," he said. "But this is only deceiving oneself. As long as the central government requires stringent enforcement, local officials will enforce more strictly." Before the regulations, communist authorities were already tightening their grip on practicing Christians. Last August, ucanews.com reported at least four regional governments had issued notices that restricted children from joining Christian groups and attending religious activities. Very sad to read this. We in Europe take our 'freedoms' for granted. I do hope some compromise can be made. Christanity has lasted for many years in spite of persecution. I feel that the more we are denied these freedoms, we find more ways of continuing. Mass can be said anywhere, with few or many worshipers. I will pray for a good outcome for you all. 'Where two or more are gathered together I will be with you.' I hope this promise of Jesus will keep you strong.